A mix of the old and the new, here are our 19 unmissable food and drink experiences to try in Edinburgh, this August. Gotta catch ’em all. Serving the best bacon roll in the city, Italian deli Maialino on William Street will set you up in grand style for the day ahead. When a little breakfast time sweetness is required, try this modern classic from Pinnies & Poppyseeds, bringing together maple bacon and a fried egg in a delicious glazed doughnut. Aside from being the purveyors of the best burgers in the city, BBL have developed an outstanding vegan breakfast. Making extraordinary things like their own vegan link and lorne sausage in-house, the super-friendly folks at this great little café have carved quite a niche for themselves. 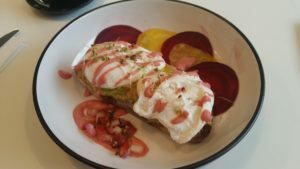 If a healthier option is what you’re after, make sure to visit Grams for accurately poached eggs on avocado sourdough toast with a delicious beetroot sauce. We’re on the cusp of “peak avocado” in Edinburgh right now, but the avocado toast from Hula couldn’t go without a mention. It’s such a bonnie and flavour-packed dish, so visit the new-look Hula to try it out. 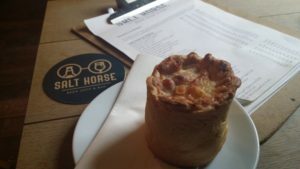 One of the most addictive items currently available in Edinburgh, the macaroni pies from Salt Horse, crafted by Twelve Triangles, are absolutely delicious. Accompanied by in-house chipotle ketchup, they’re the ideal light lunch on the go. Newly added to their previous cake-only menu, the delicious quiches from Strumpets are one of August’s must-eats. The accompanying parmesan biscuits are like crack. From their tranquil corner of William Street, take some time away from the Festival frenzy to sample a dish of elegant charm. The Mouse Larder is a great new addition to the southside, offering locally sourced deli delights, including delicious Servus haggis, served in informal café surroundings. There are some interesting local drinks to match with their excellent range of nibbles. At the heart of the excellent Boxsmall market, Jones & Son continue to sling the best street food burgers around. Their BLT is a particular favourite with me, but their whole menu is packed with class and there’s a decent chance of some diamond banter from Jones-in-chief Toby. A favourite of long-standing, the gluten-free crepes at police box café Tupiniquim are absolutely outstanding. During August there’s always something or other going on around the box, whether it’s music, dancing or just general fun times to go with the excellent food. The centrepiece of Dram & Smoke’s Festival Takeover on the top floor of the Biscuit Factory, make sure to visit their website to book for this dining extravaganza. A sneak peek at what they’re up to is available at Scran Salon on 8 August. El Cartel has firmly established itself as Edinburgh’s most popular restaurant. It doesn’t take bookings, but the wait is worth it. No visit is complete without trying their outstandingly fresh guacamole national. Taking over the kitchen at the excellent Brew Lab for August, street food legends Fresh Revolution will be serving their fresh, local food each evening from 6-11pm. Their veggie haggis arancini are the must-have dish from a menu of old favourites and new delights. 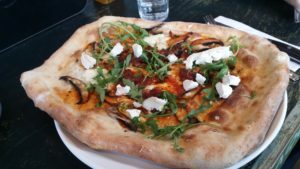 The new pizza guys on the block, Wildmanwood is ideally situated between the Fringe hotspots of George Square, Teviot, Potterow, and the Pleasance, so make sure to visit for one of their excellent rustic pizzas. A range of Senor Scoop’s signature boozy ice-creams have been available in Hoot for a good wee while, but this Festival he takes to the road with a van on George Street. Make sure to stop by for this most Scottish of boozy frozen delicacies. No list of this type would be complete without a mention for Edinburgh’s Mecca of queues, Mary’s Milk Bar. As regular readers will know, I don’t really do ice cream but the other day I sampled their milk gelato – probably the simplest thing they do – and it was absolutely fantastic. Make sure to visit during August for this, their dazzling array of flavour combos, their excellent chocolates, their Friday gelato-filled doughnuts from Twelve Triangles, or simply for a Steampunk espresso. Lucky Liquor is a magical cocktail bar on Queen Street. The new menu, launched on 1 August, is packed with outstandingly innovative creations. Their Fashionola is the best thing available to drink in Edinburgh this August. Aside from offering one of the best lunch deals available this August, The Bon Vivant has also just launched a new cocktail menu. 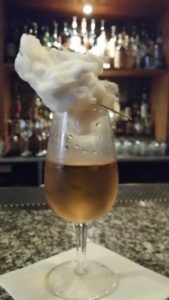 Of those we’ve tried so far, The Clouds Above the Cane with its candy floss topper is simply outstanding. Nightcap will open in its full splendour towards the end November, but for August it will be the city’s most exciting cocktail, coffee and comedy venue – and not just because of the list of absolute melters they have working behind the stick. Aside from excellent coffee from Fortitude, make sure to visit for the daily changing menu of punchy cocktails, with cocktail colossus Sam McGarry at the helm.